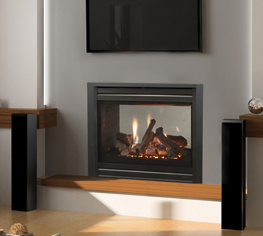 This new 36” see-through gas fireplace is our largest see-thru model. It is available in both a direct vent model and a B-vent model, both with our industry-exclusive IPI ignition system. The generous glass viewing area allows for a spectacular view of the realistic logs, golden flames and burning embers in not only one, but two rooms. With a large variety of fronts to choose from, this fireplace can complement any décor and turn any room into a true family space.